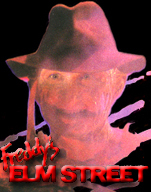 Hello, my name is Justin and I'm obvious a huge fan of Freddy and the Nightmare On Elm Street series. I've been a fan for just about half of my life. I remember when I was 9 watching Freddy's Nightmares on TV as a kid and it made a good impression. Years later as I got into horror movies, I just drew towards the Nightmare On Elm Street series and Freddy. David Lynch is my favorite filmmaker. I like a lot of his movies and Twin Peaks is my favorite TV show. Some other horror movies I like are: Re-animator, The Beyond, Zombie, Opera, Demons & Night Of The Demons.